The problem of creating multi-language applications that allow users to enter translations and even add new language without recompiling is easier than it might look at first glance. 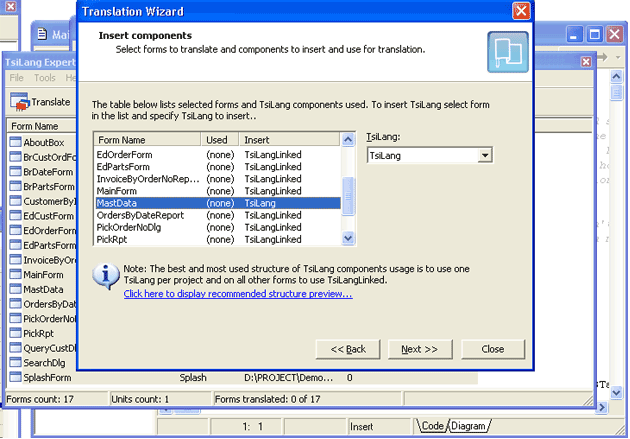 This is of course, if you use TsiLang Components Suite usage to create multilingual software. Let's describe the solution for this problem using sample project MastApp from the Demos Delphi sub-folder. We don't describe the translation process detail; assuming that you are already familiar with this part of TsiLang Components Suite. We just mention the components used for translation. We use one TsiLangDispatcher; one TsiLang and TsiLangLinked on all other project forms. Place TsiLang and TsiLangDispatcher onto MastData unit since it is auto-created and used by all project forms. 2. Creating a translations file. We can create an external translations file, either after providing the translations, or even without translations, but having just English terms. We use File|Save/Load Translations|Save Project from the TsiLang Expert menu (TsiLang Expert is available under the Tools Delphi menu). It is recommended to use SIB files to store translations as SIB files are much faster than SIL files. But you may also use SIL files as they store data in the simple ASCII format, which can be edited by any text editor. 3. Using an external translations file and dynamic update of available languages. Checking the existence of the translation file in a specified location in code, and loading it manually. Select any of the ways above, depending on your own preferences. Add the new top level menu item to the application's main menu. Picture 2. 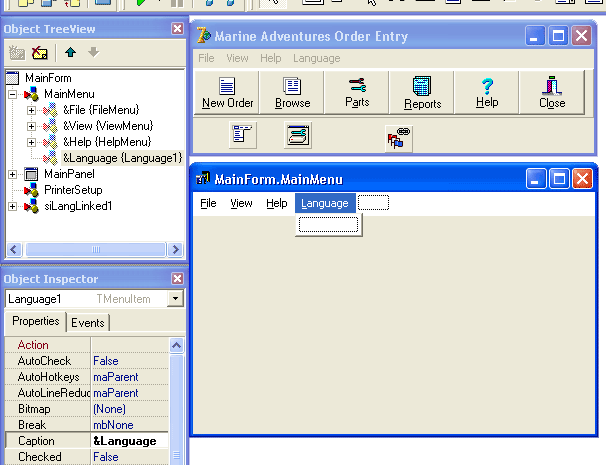 Creating the languages menu. Please note! The code of language updating and displaying must be executed after loading of the translations file. Run the project and "that's all"! The task which looked complicated at first sight was solved in few minutes using TsiLang Components Suite. Users will be able to translate your applications without recompiling and even without your assistance. You can offer your users to use SIL Editor, which could be downloaded from https://www.tsilang.com/download.html. You can download this article in PDF format here: creating_multilanguage_applications_translated_by_users.pdf.